In my Changing Your Stripes Manual, there are references from what some consider scripture. But whether a person sees certain words as inspired by God or not, the words are THERE as Ink-On-Paper — a reality that should be viewed as "Literature" . . . at least! A fair-minded person can read the Bible and receive Ink-On-Paper assertions on their own pragmatic merits; instead of pre-judging validity without thoughtful examination, and tossing potentially good ideas into a trash bin marked "Religion." A curious phenomenon occurs in contemporary society: When someone refers to a book that some deem "scripture," the ideas expressed therein are dismissed with a terse rejection:"Oh, that's just Religion." But I'm not talking about Religion . . . I'm talking about REALITY — empirically discerned, directly-lived reality. I am an advocate of evidence. Does the idea make sense, is it coherent? Does the idea work . . does it yield pragmatic fruit when applied? Can the idea be verified empirically . . . can a person double-check it against direct observation? In "Changing Your Stripes," I cite some Bible verses; and even if a person does not believe the Bible to be Divinely inspired, the words can still be read and received like any other offering of Literature — they can be evaluated on the basis of their rational, pragmatic, and empirical merits. In the last Chapter of the Manual, appropriately called "Perspective," I use scriptural citations that will be unfamiliar to some. I invite all to simply read the words . . . and weigh them against heart-felt intuition . . . as opposed to head-felt prejudice. The Apostle Paul taught: "If there be anything virtuous, lovely, of good report, or praiseworthy, we seek after these things." Paul also said "Prove all things, hold fast to that which is good." I don't care if the Apostle Paul was a Lutheran, a Leprechaun, or the Lord of the Rings (regardless of his religious affiliation or non-affiliation) . . . these previous statements stand on their own merits — the truth they declare is self-evident! INK ON PAPER . . . SYMBOLS THAT MEAN . . . WORDS THAT CONVEY A MESSAGE. And if that message IS good . . . let it BE Good! And if that message IS Real . . . let it BE Real! when they are really just rearranging their prejudices." while all the rest went on with their old measurements." Instead of bringing your old measurements to the interpretation of words, I invite you to measure the worth of so-called "scripture" by visiting them "anew," . . . coming to them with fresh perspective, letting them fit to your heart as they will. In my counseling practice, the teaching tool I use most is found in the Changing Your Stripes Manual, which has 5 additional chapters that the "Book" does not: Poetry, Proverbs, Practice, Principles, and Perspective. These 5 chapters contain resources I use in counseling. The following Table shows Three Problems and Two Ways of approaching each problem. 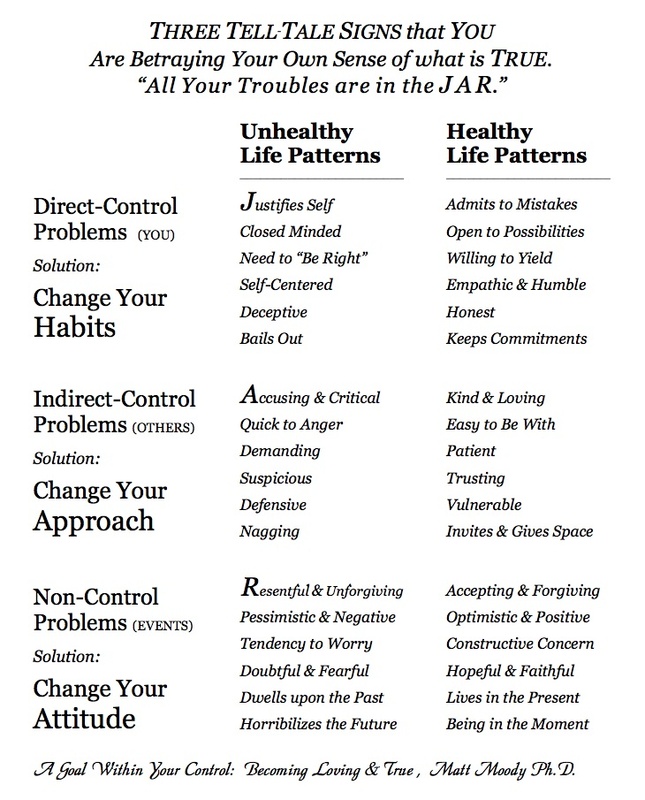 This teaching tool is useful because it quickly clarifies the bad behaviors that will further feed and fester a person's problems; or this chart indicates behaviors that will fix problems fast — the "Healthy Life Patterns" also assure your personal peace and invite others to enjoy the same. Download a pdf of Dr Matt's Three 3 Problems Table. "Unhealthy" Life patterns point to a person's inner conflict: inner turmoil that occurs because people betray their own sense of right. I learned the three-problems" categories while I was serving a 2-year Church mission in Alberta, Canada. Stephen R. Covey gave a leadership presentation to a group of missionaries, and taught these 3 kinds of problems. But even better, he identified the solutions within our control for solving them. An essential key to understanding human relations, the living realities you can SEE . . . is in understanding the workings of what you CAN'T SEE. Because traditional psychology does not account for the influence of the unSEEN world, this is one huge reason why contemporary psychology goes astray in many of its explanations. Generally speaking, behavioral science disregards unSEEN realities because: they cannot be "directly" observed. Yet the consequences of unSEEN realities are perfectly empirical. In other words, we indirectly see, feel, taste, touch, and smell the impact of unSEEN influence on a daily basis — that is, if we are in tune to discerning them: If we have "eyes to see and ears to hear." NOTE: The spelling unSEEN symbolizes this idea: just like the wind, Spirit is invisible; yet like the wind, the impact and consequences of Spirit, are clearly SEEN. When the Spirit draws near, this is an expression of God's Love; His drawing-near is brings peace and contentment, a comfortable peace that reinforces the good we have done. This manifestation of Love lets us know that we have behaved in ways that please Him. Thus, feeling the presence of God's Love and Light lets us know we are moving in the right direction. This is one way God helps us fulfill the purpose of our creation. In contrast, the withdrawal of Spirit from us . . . is also an act of God's Love; this withdrawal leaves us to grapple with the forces and influences of darkness — for when Light leaves, darkness enters in. And as we contend with the darkness of depressing emotions, in these moments, we can know that the choices we have made, are not pleasing to our Creator. NOTE: Knowing that our choices do NOT please our Creator, is the correct conclusion. However, traditional psychology will confuse what is clear: some psychologists will tell you that "It's Not Your Fault" and prescribe a pill — suggesting that you played no role in creating your problem. Why is the withdrawal of His Spirit Presence an act of God's Love? Because by communicating a course of correction, Heavenly Father provides a way for His children to get back on track — the track of self fulfillment and refinement. By drawing near and also withdrawing, God tells us the way to joyful living! To Impact Others to their Eternal Advantage. scourgeth every son whom he receiveth. While this explanation is a truth taught by the scriptures, even without scriptural backing, the Reality of Spirit Presence and Spirit Withdrawal is manifest independent of what you and I might "think" or "assume." In other words, Life Realities exist independent of what we "believe." In this way, Life Realities are stubborn: by the consequence you experience due to choices made, Life Realities will communicate over and over again, God's message of self fulfillment and refinement — God's unSEEN influence to your Eternal Advantage. The impact of Spirit Influence is clearly discernible! The Consequences of Spirit Withdrawal are before our eyes. Surely you've SEEN the dark countenance and felt the disconcerting presence of a person who has made destructive choices? And in contrast, you've SEEN the shine of goodness that radiates from people who choose Love and Light. This is the empirical evidence of unSEEN Realities! Outward observable realities of mortal life that evidence the reality of invisible wind called "spirit" — the unSEEN influence of spiritual Light and spiritual darkness. "An object in motion will remain in motion unless acted upon by an outside force." The Terrorist of Radical Islam were not born to kill their perceived enemies; instead, they were taught by an outside force — and without this outside influence their motion and course through life would NOT have traveled toward mass murder. Just as there are outside forces to influence directions of darkness, there are also outside forces that influence and inspire movement toward Light. The momentum of Love and Light was our guiding energy from the beginning — the immaculate motion in which we were set from birth. To deviate from the momentum of our natural innocence, requires the intervention of an outside force. The unSEEN powers of darkness are the force . . . that entice us off a loving course — ironically, this happens with our permission and participation. A Truth that empirically supported through empirical observations, as well as through the words of the Bible — ink-on-paper and literature at least.